in the early 1980s for three years we lived in a wonderful three-family home on orange street in new haven. the house was wonderful because we shared it with a variety of interesting, creative, and friendly people. we lived on the second floor, on the third floor was a young married couple who had deep roots in the area and they were 'townies' like us. however, the first floor seemed to attract students. when we first moved in a lovely young couple named jenny and karl lived there, but soon they graduated. after jenny and karl left, marty, ruth, and karen moved in. for a while we stayed in touch with karen and ruth. after ruth graduated she taught in vermont at a progressive boarding school. we visited her which stimulated my longtime (unrequited?) love affair with vermont. however, after a year or two she went to graduate school, completed her ph.d, joined the world of academia and became recognized and accomplished in her field. I haven't had contact with ruth for at least twelve years, I think I dropped the ball when we moved to cleveland. but through the wonders of facebook, yesterday I found her name and sent a 'friend request' - so now it's whether I am accepted or ignored. after karen graduated she went to new york city. we visited her once or twice when she lived in new york. then as often occurs, life happens and we lost touch with karen. 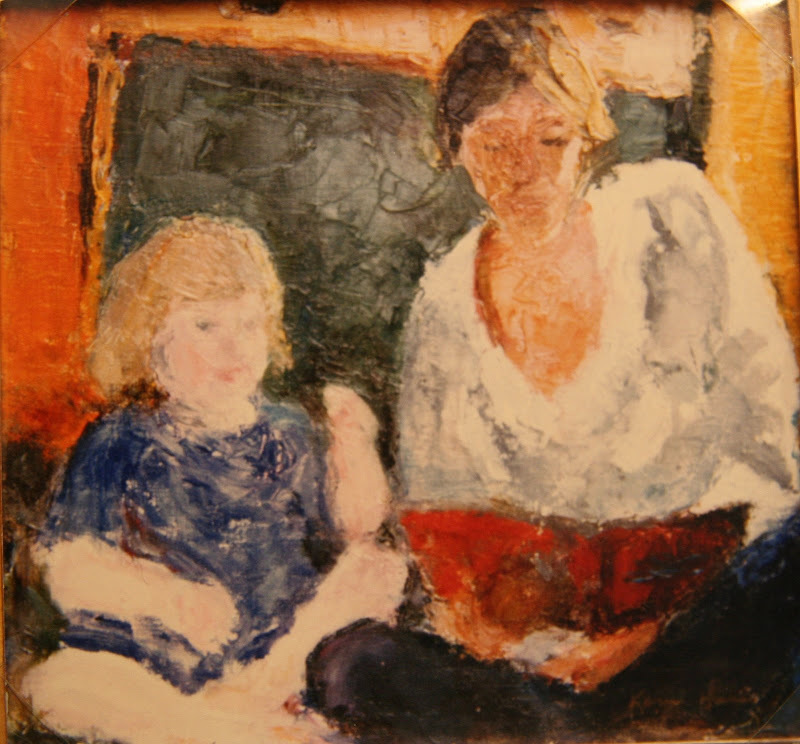 the other day I started wondering about where karen is, I ran across a small slightly curled up photograph of a portrait that she did of em and I when em was around three years old. I can't remember if the painting was done for a class or just because - karen was passionate about painting and still is. When your post first opened on my screen, I thought the image WAS a Mary Cassat! Isn't blogging and face book opening up our lives to re-connect with old friends and make new ones fabulous? Now this is one part of globalism and technology that is a keeper! I love love love that portrait! Oh, I would have loved to have seen a portrait of you and Em. What a nice eddy of memories in your stream today. I got a facebook invite . . . but I hear that they have changed the rules so that they own everything on there, even if you fold your membership. So I am conflicted. An old high school friend recently sent me an e-mail out of the blue; I hadn't seen or heard from hear since 1975! The classes from the 70s combine for one joint (!) reunion and this next one is this August. They're calling is MontStock. How odd to think that this precious moment of personal history is floating off somewhere else, living with someone who doesn't know its context but took it to heart anyway. cassatt is who i thought of immediately on seeing the painting. as an artist, i do find it interesting to think about what my work means to the people who choose to live with it. probably not what i felt when i created it in many cases! and on the facebook note- an old colleg friend found me yesterday- even tho i don't have my college info in my profile. this technology thing is amazing! have a great weekend! john - I have one friend from college that I really would love to find - she has been mia since we graduated, not only to me but to all our mutual friends. there is no trace of her that any of us can find it's so sad when this happens. of course our lives do seem to be peppered with lost friendships....but happily, with an open heart, one fill the void with new ones. law - amazing isn't it! ca - here's to old and NEW friends! meri - as long as it's hanging a good home I'm happy! it is a weird thought though!!! maybe since it features em and I reading together it will end up someday in a public library's children's department....wouldn't that be amazing! the colors on that painting! wonderful. Great song. Here's to you and your friends, kimy - both new and long-lost. What a shame you didn't get to retain the portrait, it's lovely. And for all the criticism of Facebook, it certainly is wonderful for connecting with old acquaintances, I hope she adds you as a friend! Actually, when I saw the painting I thought it was a Bonnard. Mary Cassatt was very much an Impressionist, while this work is much more in the Post-Impressionist style, and very much in the style of Les Nabis: Bonnard, Vuillard, Maurice Denis... This one looks very much like some of Bonnard's studies. You can see what I mean here, here, and here. I lost touch with most of the people I went to school with,but in 2001 reconnected with my high school graduating class. We scattered to the four winds after graduation, and while some have actually stayed in (or returned to) the area of MD where we all grew up, most now live all over the place. We have a mailing list with Yahoo Grous, but nowadays most of the group is on Facebook. Heh, heh! They're probably the only reason I keep an account there. Nice to see and hear Greg Lake at his peak. Thanks. baino - we were only karen's models, there was no expectation of retaining the painting. i would love to see it again...perhaps some day. roy - stylistically perhaps you are correct. but especially in this painting, the subject (woman and child) is quite cassatt-esque! i love the post-impressionists, have always had a soft spot for bonnard, probably because of his habit of including cats and dogs (and birds) into his paintings! leaves *me* speechless--i hate typos! "Pictures at an Exhibition" always brings to mind Mussorgsky, which my sister played for her senior college piano recital. How cool is THAT? And how nice that you have a photo of it. Maybe you will get a chance to buy it back someday? Good idea for a short story there, I wonder if it's been done? Probably has. The majority of my high school class is still in and around the Bay Area (well, there were only 86 of us) and I think I've collected about 20 or so on the Facebook. I like it. I haven't thought about that ELP album in a long time. Having it made me feel totally sophisticated! tut, Facebook reversed that policy this week. In the past year I've reconnected with a bunch of my old high school classmates ... and my writings and opinions have alienated most of them. So, now I know why I didn't keep in touch. But lots of my college and grad school friends are still dear friends, right, kimy? The reality of memories and the conversation and friendships like this occur outdie of time, so it seems. I have had friends and conversation associates like these. AT ASU in the 60's at the dorm. Since then new ones. But not the same. Could not relocate them. But they are in my mind. flawsnall - i hate tpyos too but they seem to love me. no worries! willow - off to check out mussorgsky! name doesn't ring a bell... or should i say chord? edward - so amazing how many memories and people a mind can house! You've had better luck than I have on Facebook!